Happy birthday to our Magpie of the Month, Queen Paola of Belgium! 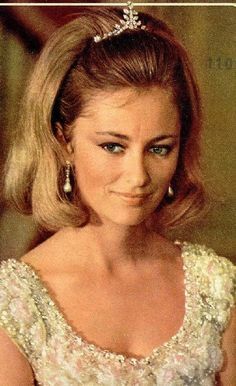 Paola was born into a family of Italian aristocrats in 1937, and although she married a Belgian prince, she was never expected to become queen consort herself. As the wife of a younger son, the jewelry she received at the beginning of her marriage was more modest -- and it actually remained that way throughout her life as a princess and as a queen. Today, we're talking about one of the lovely small diamond pieces that she owns: the necklace that can also be worn as a tiara. Paola has been wearing the piece as a necklace and as a tiara since the early years of her marriage. There's speculation that she was given the necklace either as a wedding present in 1959 (possibly by her new husband?) or as a gift in honor of the birth of her first child, King Philippe, the following year. It's essentially comprised of two rows of diamonds -- a chain from which a row of tiny drops are suspended -- and a slim pendant piece. While the festoon-style necklace hasn't been worn as a tiara, Paola wore today's necklace as a tiara several times as a young princess. You can just see the small tiara peeking out of Paola's complicated hairstyle in the photo above. 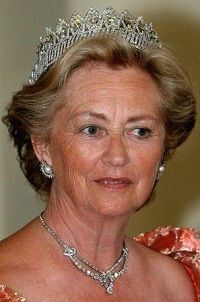 During her years as Belgium's queen consort, Paola had access to two significant tiaras: the Nine Provinces Tiara, reserved for the nation's queen, and the diamond bandeau that she had been given by her father-in-law. But the delicate diamond necklace still played an important part in her jewel collection; above, she pairs the Nine Provinces with the delicate necklace during a state visit from the Norwegian royals. When Paola's husband, King Albert II, abdicated last year, the Nine Provinces Tiara was transferred to the collection of the new queen consort, Mathilde. But along with her diamond bandeau tiara, Paola also retained this necklace. The former king and queen have largely kept a low profile since the abdication, but if we do so Paola appear at another glittering event any time soon, I wouldn't be at all surprised if this favorite necklace is worn as a prominent accessory.